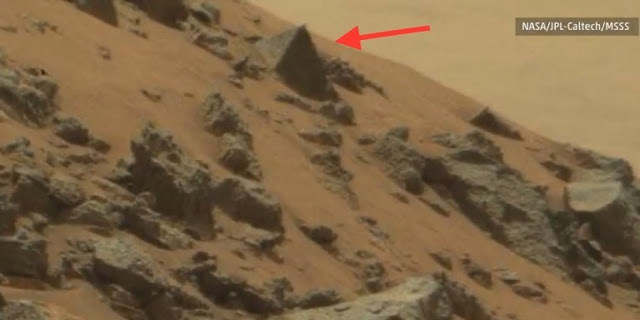 NASA's Curiosity rover has snapped a pyramid on Mars--at least that's what several paranormal devotees seem to think. A new YouTube video from Paranormal Crucible maintains that a photo taken by the rover's Mastcam camera on May 7, 2015 displays a pyramid of "near perfect design and shape" and that the object is possibly "the outcome of intellectual design and definitely not a trick of light and shadow." Not surprisingly, NASA's clarification for the object in the photo is rather simpler. Dr. Jim Bell, deputy principal investigator of the Mastcam examination program and also a professor of astronomy at Arizona State University in Tempe, told The Huffington Post in an email. "It is a rock. It is possibly a volcanic rock (like most rocks that we've seen with rovers on Mars), and just like numerous volcanic rocks on the Earth, many volcanic rocks on Mars breakdown and cut in very sharp, pointed ways. This one happens to have chopped into a pyramidal form, which is essentially not too rare among hard, thick volcanic rocks on the Earth either." Photo taken by NASA's Curiosity rover on May 7, 2015 displays a car-sized pyramid on Mars. Curiosity was launched into space on Nov. 26, 2011 and landed on Mars on Aug. 6, 2012. As for the size of the rock, Bell said an examination by the Mastcam team proposes that it's only about four inches tall, or the height of an 8-ounce soda can. Bell, who called the photo "fun to look at...but not mainly Earth-shattering," appears to have been trying hard not to upset anyone who believed the pyramid story. Ouch. And this isn't the first time statements about bizarre objects on Mars have been shot down. In some recent months people have seen everything from a skull and a thighbone to an iguana. As for little green men, no detections reported--yet.